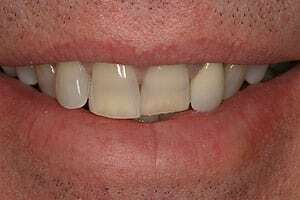 Porcelain veneers are thin wafers of porcelain that are bonded to the front of your teeth to give you a new smile. They can change the color, alignment, or length of teeth. They can make crooked teeth look straight. Gaps, chips, stains, and many other things that may be wrong with your smile, can be corrected. Dr. Thein is a cosmetic dentist who has the training and the artistic talent to create a beautiful new smile for you with porcelain veneers. He is so confident that he can give you the smile of your dreams that he offers a beautiful smile guarantee. prior to placing them. And they mimic the appearance of your teeth so closely that it isn’t possible to distinguish veneered teeth from your natural teeth. Advertising for Lumineers implies that, if you have a smile makeover done any other way than with Lumineers, you will need to have your teeth “ground down.” But if you examine the photograph on the left, you will see that the underlying tooth that is going to receive a porcelain veneer is not “ground down.” Sometimes they can even be placed with no prior tooth alteration. In most cases, a light shaving of the tooth needs to be done. 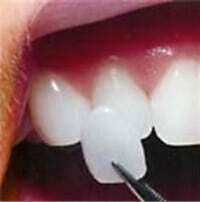 Only in cases where teeth are protruding or severely out of alignment does any extensive grinding need to be done. They mimic the appearance of natural tooth structure almost perfectly. The color can be manipulated to match your teeth exactly. The translucency can be varied to achieve whatever effect is needed. Both color and translucency can be varied within the restoration to duplicate the variation that is present in teeth. And the surface texture and gloss can also duplicate enamel. They are very stain resistant—more stain resistant, in fact, than natural tooth enamel. As long as the surface glaze isn’t broken, they don’t absorb stain. They are extremely durable. 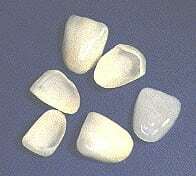 Porcelain has more wear resistance than enamel. They are color-stable. When properly cared for, they won’t fade or darken over time. They are totally customizable. The color, shape, surface texture, and translucency can all be manipulated to create your dream smile. 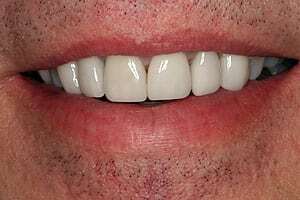 Below is an example of Dr. Thein’s beautiful cosmetic dentistry on one of his patients. This is John. 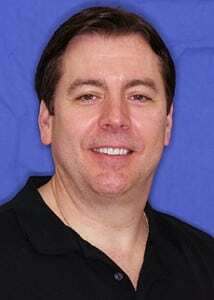 He had been a patient of Dr. Thein’s for several years and had grown to trust him. One day, he decided to ask Dr. Thein to help him fix his crooked and stained teeth without braces. 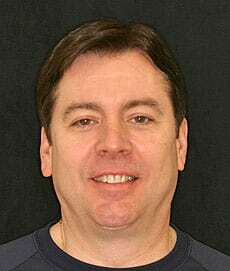 Here is a picture of John with his new porcelain veneers. His smile is now bright, straight, and confident.